Home/Alpaca Library, Fleece and Fiber, Willowbrook Chronicles/Preparing alpaca fiber for the mill. You’ve made the decision to send your alpaca fiber to a mill for processing. Now what? How do you prepare it for the mill? Carefully unroll your noodled fleece on the skirting table. Now you are ready to skirt the fleece. This simply means removing pieces of fleece that don’t belong with the rest. Start by going round the edges of the fleece. 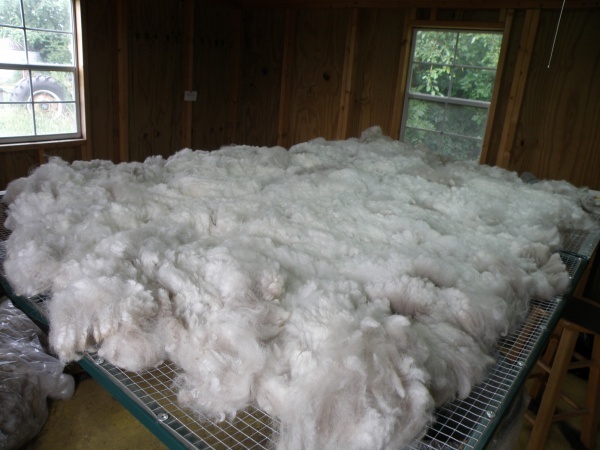 If you think about how the blanket comes off the alpaca at shearing, you will realize that this fiber comes from near the belly area or legs. It will likely be coarser and contain guard hair which you don’t want in your yarn or roving. While you do this, check the length of the staples.The edge fiber is often shorter than the rest. Mills can usually deal with differences in length of 1 to 1.5 inches without affecting the final outcome. 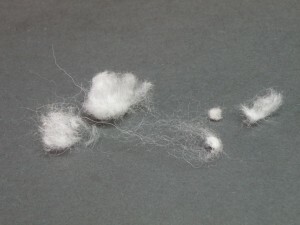 Remove any areas that are very short compared to the rest of the fleece. With the cut side up, you can see all the second cuts, (short pieces where the shearer has not taken a full cut), as well as small pieces of fluff that were caught in the shearing comb. You can run the edge of a credit card or index card over the fleece to help you find these. If these small pieces are not removed they can end up as small bumps in the yarn. Badly soiled areas should also be removed as well as vegetable matter. The cleaner the fleece is when it goes to the mill the better the end product will be. 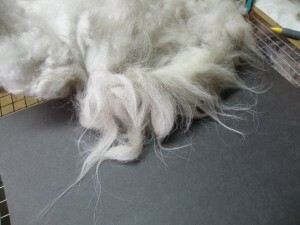 If the mill has a dehairer it is usually worth the extra cost to run your fiber through. This will remove coarser fibers and also fine vegetable matter that is difficult to remove by hand. Now you are ready to bag and box your fleece and send it to the mill. If you are sending several fleeces you can keep shipping costs down by removing the air from the bags with a vacuum cleaner and tying them tightly so that you get more in a box. Once the fleeces are on the way to the mill you can sit back and wait for your beautiful yarn to be returned! By willowbrookadmin| 2017-12-29T20:48:54+00:00	August 11th, 2016|Alpaca Library, Fleece and Fiber, Willowbrook Chronicles|Comments Off on Preparing alpaca fiber for the mill.